In light of recent lurches toward authoritarianism in Hungary and Romania, the European Commission adopted today (11 March) a mechanism for addressing “systemic threats” to the rule of law in any of the EU's 28 Member States. The new framework, presented by Commission President José Manuel Barroso, Vice-President Viviane Reding and Home Affairs Commissioner Cecilia Malmström, establishes an early warning tool allowing the EU executive to enter into a dialogue with the member country concerned to prevent the escalation of systemic threats to the rule of law. Reding, who is responsible for Justice and Fundamental Rights, said that the Commission, as guardian of the EU treaties, also had to become the guardian of the rule of law in the Union. The new mechanism will not deal with individual cases or miscarriages of justice, but only with “systemic threats” to EU values. Examples cited by Reding include Hungary, where the ruling conservative Fidesz party has threatened the independence of judges, or Romania, where the ruling socialists have tried to dismantle the country’s constitutional court. In his last State of the Union speech, Barroso expressed concern that the Commission's options were currently limited. Brussels can only either launch an infringement procedure or go for “the nuclear bomb of article 7”, of the Treaty on European Union (TEU), which says that serious human rights breaches can result in countries losing their voting rights in the EU Council of Ministers. Members of the European Parliament have called for an activation of article 7 against Hungary, whose government has been warned many times by EU institutions that it was violating the EU’s fundamental values. Commission assessment: As a first step, the Commission collects and examines all the relevant information and assesses whether there are clear indications of a systemic threat to the rule of law. If the Commission makes such assessment, it will initiate a dialogue with the country concerned, by sending its "rule of law opinion". The country concerned then has the possibility to respond. Commission Recommendation: In a second stage, unless the matter has already been resolved, the Commission issues a "rule of law recommendation" to the country concerned. It recommends that the member state solves the problems identified within a fixed time limit and informs the Commission of the steps taken to that effect. The Commission then makes its recommendation public. Follow-up to the Commission Recommendation: In a third stage, the Commission monitors the follow-up given by the member state to the recommendation. If there is no satisfactory follow-up within the time limit set, the Commission can resort to one of the mechanisms set out in Article 7 of the EU treaty. "In the past few years, every time there has been a threat or a potential threat to the rule of law in one member state, all institutions have turned to the Commission as the impartial arbiter asking us to take action," Reding said. She also made clear that the EU wanted to keep the issue in-house, saying the Council of Europe should steer clear of EU matters. The Council of Europe the oldest European institution specialised in human rights, where Russia also sits. “Just to link to other discussions we have in recent days, we should not give President Putin a say on a debate which leads to the suspension of treaty rights to a member state. That’s why not the Council of Europe, but the European Union has to take a decision,” the Commission Vice President said. A new EU minister of Justice? At the same time, the Commission outlined its vision for the future of Justice and Home Affairs policies in Europe. 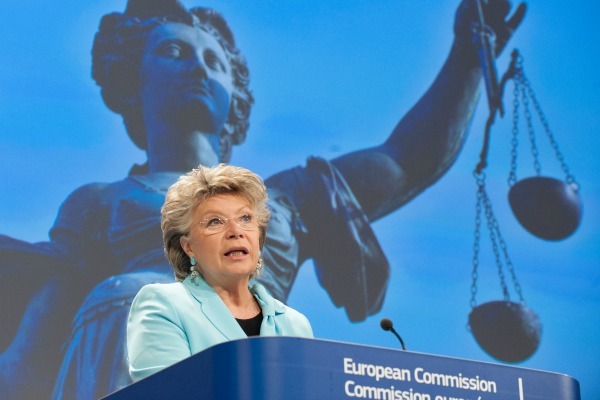 Reding explained that in the space of just a few years, justice policy had “come out of the intergovernmental shadows into the limelight of European Union activity". "The incremental steps we have taken over the past years can be followed by bigger leaps in the future. Further in the future, I see the need for an EU Minister for Justice taking the helm at central level, giving EU justice policy a face and of course, held accountable to the European Parliament," the Commission Vice President said. Reding is seen as a potential candidate for a major EU post following the European elections, although her chances are dimmed by the fact that her compatriot and party fellow Jean-Claude Juncker is the candidate of the centre-right European people’s Party to replace Barroso. Barroso said that with the presentation of the Commission’s ideas and top priorities beyond 2014 the EU executive was helping prepare the June European Council, which will adopt strategic guidelines for the future. Since 2009, the European Commission has been confronted on several occasions with crisis events in some member states, which revealed specific rule of law problems. Such examples is the handling of the Roma issue by the former French President Nicolas Sarkozy, attempts to impose one-party rule in Hungary and an attempted crackdown on the judiciary in Romania. In his 2012 State of the Union address, Commission President José Manuel President Barroso recalled that a Political Union also means that the rule of law, as a founding value of the EU, must be strengthened, announcing an initiative to this end [read more]. Last October, the Commission adopted its work programme for the last year of mandate, which draws out an unprecedented framework to ensure respect for European values in member states [read more]. Such things are always good to know, thats why im trying to keep up to date about eu information concerning the community itself or just some subfacts. It feels so good to know that euroextremists and their american bankster friends are hard at work. By the way the americans have just removed 33 tons of gold out of the ukraine and into the american federal reserve ,so in fact the ukraine wasnt so poor as told, they didnt need to ask for help ,they have or had gold. The whole thing was for the gold . Im sure thell get an I.O.U. The american banksters are doing the europhileshuffle right now..
Redding should back of and do something constructive, until all the european countries have given the people in/out referendums shes really a defacto wannabe politician, its a classic case of putting the cart before the horse or in this case the euro before the people. Define eussr values, that could be anything after all it has no problem with corruption so being against it would be against their values, it is in favour od the democratic deficiency so that is also one of their values seems the only way to stop the commissions never ending power grab is to leave. Surely the Commission and its staff are the main threat to the rule of law within the EU?